Coming soon. I had hoped to release v0.3 of Kanji Sieve in May, but it will now be mid-June. It required a lot of work. I’ve been cleaning up the behind the scenes scripting etc. and learning a lot as I go along. All the features I want for v0.3 are in place and working (hopefully without any bugs). What I am now mostly doing is sorting out the fonts on Windows. I also have to make some decisions about Kanji Notebook. I am using some data from it but there’s at least a month’s worth of work before the file is usable as a notebook. It possibly needs to be truncated and definitely needs to be locked away from the user in this release. Some screen shots after the jump. Here is where you can see the statistics for a document and make your wordlists. 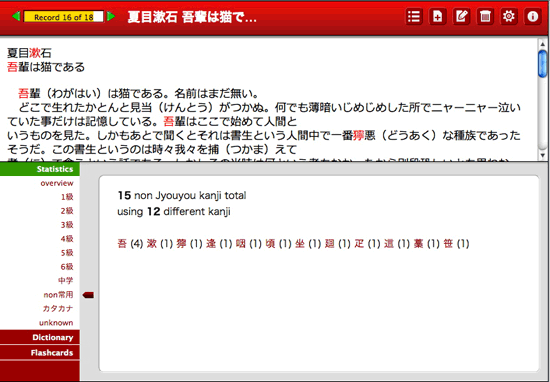 I’m pleased that I can get the kanji to highlight depending on the tab being viewed. I’ve based it around a netbook’s resolution of 800 by 600. I found it didn’t use extra horizontal resolution and I could make the layout expand vertically if there was a larger screen. I’m fairly happy with the interface, I don’t think it will change radically from now on. I may try to iconise it a bit more, maybe use more Japanese as the default language. I’m not sure I have the energy to make it capable of being localised without starting from scratch. My development strategy has been too haphazard really. I want to put my energies into features I want to use first and foremost. In this version, you will be able to keep track of multiple files. Here the user will be able to sort and select documents, and perform certain tasks like editing and deleting. 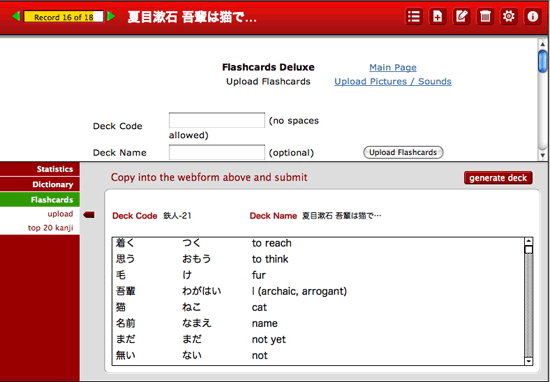 My iPod Touch flashcard program of choice is Flashcards Deluxe. Using FileMaker’s webviewer I’ve made it easier for me to upload decks. 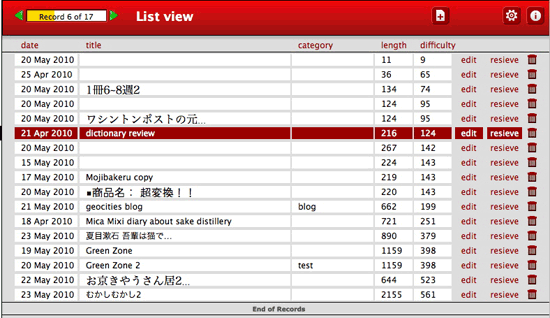 There is also automatic generation of a list based around the most frequent unknown 20 kanji from your documents. I’d like to expand the management of wordlists in the next iteration of KanjiSieve. This is one of a few features I feel I have to get clearance for before I upload Kanji Sieve v0.3 for public consumption. The web is a rich source of data. It’s fine for me to mash it up for myself but to wrap my own app around a webviewer is a different matter. I’m only really automating some of what could be done with a normal browser and concentrating it for ease of use but … it’s best to get agreement. I already have a list of to-do’s for v0.4 but for now, back to the home straight on v0.3. Windows cleanup is not going well. Many things are ok-ish. But the webviewers are sometimes spectacularly messed up to the point of mojibake. One so badly I’m not sure where to start. I had hoped css would take care of webviewers and conditional formatting would take care of FileMaker native text, but no, I have a lot more work than I thought to Window-ise what I’ve done. If you want it to look good FileMaker’s not as cross-platform as you might hope. If I can’t solve these problems I might end up with a Mac only solution. Sorry to hear you´re having problems with Windows cleanup Robert. Don´t get disheartened! 1. Could you make the program skinnable or at least change the current livery. I´m afraid the blood-red colour you´re using at the moment tends to set my nerves on edge. I prefer Steel-Grey or Light Blue. 2. On the localizing question. Would it be possible to include an English .lng file and leave it up to users to translate it to their local language. If not, I think it would be better to use Japanese as the default language and include a translation list Japanese-English in the Help file. Unfortunately, having just announced a possible June release, for unforeseen personal reasons I probably have to put this project to one side for the foreseeable future. If I can, I will release the Mac version. The problems with the Windows version are such that I won’t have the time and energy to devote to it. I can only offer apologies and hope that I will be able to return to it at some future date. I can think of a way to do it so some form of customisation is a possibility. Or I might just go more gray for the public release. But at the moment… gomen ne. I am trying to develop something 3 DCD . exe and I need some help . If someone is in the same situation i am prepared to have a mate .thank you!! !